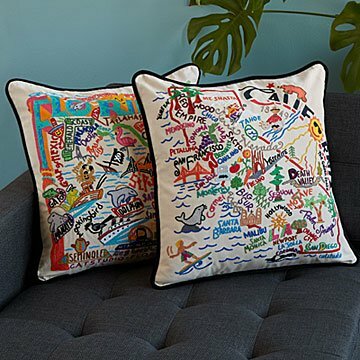 Celebrate your favorite state with a pillow embroidered with its famous sites, cities, and cultural icons. Celebrate your favorite state with these lively, festive hand embroidered pillows. Using thorough research and vivid pictures laid across the state's outline and name, each pillow packs in its sites, cities and culture with flair. A brilliant way to celebrate where you live, where you came from or where you've just traveled, these pillows feature black velvet piping and a soft polyfill and are sure to become heirlooms and delightful additions to your home. Handmade in India. Click to see all available State Pillows. Please note, states may not be in alphabetical order in the drop down. I bought this for my daughter who moved to Colorado a year ago. I loved the chicago pillow I had received as a gift, and I knew she would like hers. Big success. Embroidery is well done with major highlights. This product was a loved gift! Parents LOVED this gift! Embroidery was beautiful!! What a perfect gift for a dear friend moving out of town! This pillow is amazing ... larger than I thought but really well-done! Super colorful, well made, and inclusive of a lot of the attractions/points of interest in the state, I'd buy another one in a heartbeat! Embroidery looks great. Lots of fun landmarks from each state. We recently moved and bought a rug for our living room. We bought it online and it came in much brighter than expected. These pillows match it perfectly. I purchased the states that my husband and I grew up in. They're very fun and sentimental. The only con is that they are expensive. The pillows we purchased are lovely. Absolutely beautiful! We will treasure this for a lifetime. This was an anniversary gift. I bought this pillow in the state of South Carolina pattern. A co-worker is being relocated to Texas and I wanted to get him something unique to remember South Carolina. This pillow is very unique and well made. This will be my standard gift to welcome new employees and those employees that relocate to other divisions of my company. I am the executive assistant to the CEO and I am always looking for unique gifts, this one did not disappoint. Thank you!